This article will be broken down into 3 main sections. Viewing Bandwidth - This section will show you where to check your bandwidth usage and how to understand the date ranges. 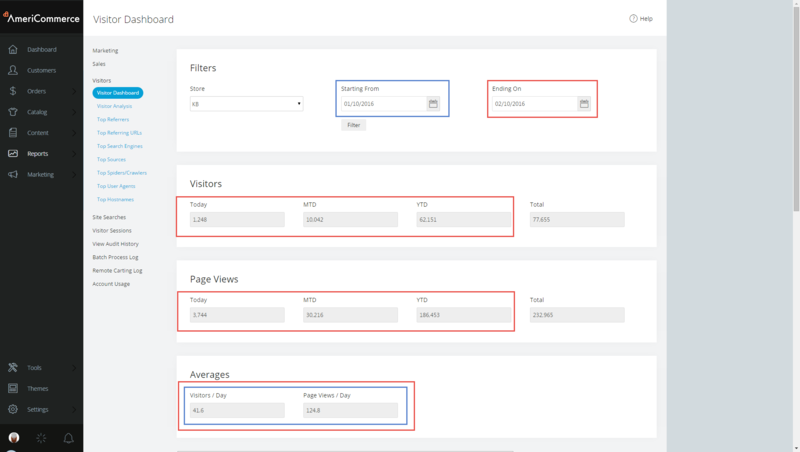 Understanding Visitor Reports - This section will go over the visitor report in the admin and what the terms mean. Managing Bandwidth - This section will go over the options that you have blocking unwanted visitors, managing image sizes and best practices to keep your bandwidth usage under control. We want to focus our attention on the right column and look at the service usage for Bandwidth shown below. 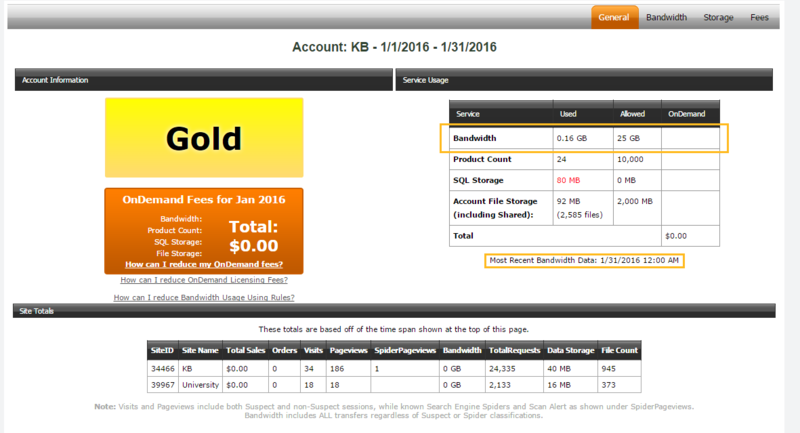 Note: Pay special attention to the Most Recent Bandwidth Data date at the bottom of the chart. At the beginning of the month this date stays at the end of the previous month to allow you to review bandwidth data as a whole for the entire month. Multistore Tip: At the bottom of the image above is a store by store breakdown of your bandwidth data for the active date range. Now that we know what the overall bandwidth usage is, we can look at some more details to see what is composing that bandwidth. Select the Bandwidth Tab in the grey menu bar at the top. Now scroll down and look at the totals areas shown in the screenshot below. On the left you can see what file extensions are consuming most of your bandwidth. The important information to look for here are file extensions that indicate images such as jpg, png, bmp. If your images are consuming most of your bandwidth you will want to read the section on Adjusting Images. On the right you can see the pages that are generating the most bandwidth. Here you can identify which images are consuming the bandwidth and you can make sure that your traffic is going to pages you expect. Your site may not be using manufacturer pages but it is high on your list, that could through a red flag. Underneath both the above reports you will see that there is a section that lists multiple IP addresses. This allows you to see which IP addresses are visiting the site the most. You will want to make sure that this section is not full of bots that are hitting your site consuming bandwidth but not providing any benefits. First we will go over the Visitor Dashboard. 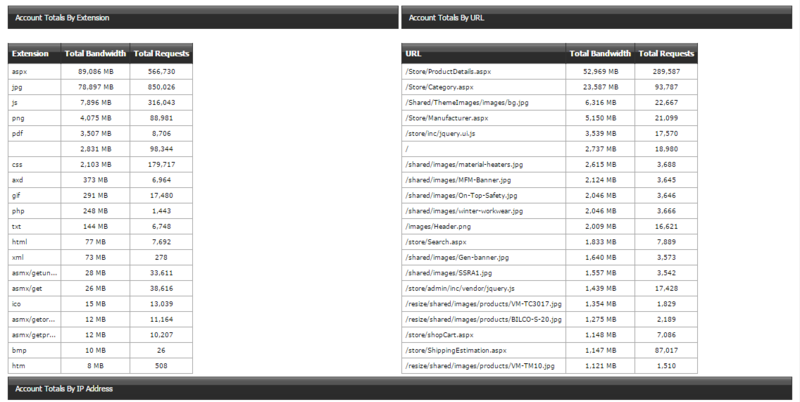 Navigate to Reports > Visitor Reports and the dashboard will be the first thing that loads. To understand this reporting section correctly please refer to the color coded image below. Note: The Total area will not update when you change date ranges. Note: Since Today is based off of Ending Date the data reported in that cell is for the Ending Date day, not necessarily the current day that you are viewing the report. All graphs at the bottom of the page are adjusted when changing the date range. These can be used to check your most popular pages, most popular day of the week and most popular hour of the day. For bandwidth investigations we are interested in page views. Make sure that the most popular pages make sense for your store. Make sure that the most popular hour and day make sense for your store. If you see that traffic spikes at 2AM on Sunday night but you have 3 sales during that time it might throw a red flag. Now that we have an overall understanding of visitors that are coming to the site and what times and days they are coming we need to make sure these visitors are real people and not bots crawling your site. Navigate to Reports > Visitor Sessions. First thing we want to do here is open the Search Options, select Only Suspect, set the appropriate date range and click Search. What is a suspect session? A suspect session is an IP address that visits your site at least 5 times in less than 10 seconds from a different browser session on each visit. If a real customer is navigating your site they use the same browser window and follow the links. Even if they open a new browser on the same computer the session is shared unless they switch from Google Chrome to Firefox for example or they may open a private window. But that only equals 2 times so it is highly unlikely that a customer will end up in this Suspect Only view. A suspect session is also not a known spider or crawler. This means that Google Bots and other known search engines will not show up in this view. That means that the Only Suspect view are sessions that you may not want visiting your store at all. If you find traffic here that you do not want refer to the Managing Bandwidth section of this article. Note: It is possible that 3rd party site scanning programs will show up here and if you use their service you do not want to block their IP Address. Pro Tip: Use the date range data that you got from Visitor Dashboard to narrow down your search in the Visitor Sessions. Example If your heaviest day of the week is Wednesday you may want to pick a date range that includes only Wednesday. Then compare that to your busiest hour and look for that hour in the visitor sessions. Once there you will want to use the search features and sorting options to find the visitors that you want to block. How do you know if you should block a visitor or not? A good rule of thumb is if the session is a suspect session and it hit your site more than 10 times in less than a minute you probably do not want it visiting your site and it is okay to block. This does not apply in every case and if you are unsure of whether you should block it or not we recommend leaving it alone and reviewing it again in the future if it shows up again. When you have a visitor session identified that needs blocked select the checkbox to the left and choose more actions in the top right corner of the screen. Once there you will see 2 options for blocking: Block IP Address and Block user Agent. That is general browsers that real customers may be using. Blocking a user agent like that will block legitimate traffic to your site. If you do not know what a user agent is, do not use this option. Again we strongly recommend using the Block IP Address when possible. You may have noticed that a lot of your bandwidth is coming from images and need to reduce it. There are a few options that you have. You can set-up your images on a CDN and reference your images from the CDN location. A CDN is a Content Delivery Network. Common CDN's are Amazon Cloudfront and CloudFlare. You can also turn off the image resizer and just use direct reference. If you choose to do this you will need to make sure that your images are uploaded to your store at the correct pixel size. All the images will pull in using the original image size that you uploaded to your store. To turn off the resizer you can go to Settings > Catalog and scroll down to the Product Photo Handling section to change the Resizer option. You can edit your images to have a smaller pixel size so that the file size smaller. Then when the image is loaded on the store the loaded file size will be smaller reducing in less of a bandwidth footprint. If you noticed all the image options require manual implementation and you will need a 3rd party to host the images (if you choose to use a CDN) and/or a program on your computer to edit images to reduce file size and adjust dimensions. Below is a bulleted list of a few best practices that we recommend to keep your bandwidth under control. It should be noted that these are only suggestions and we recommend them so that you can be proactive in managing your bandwidth. Check your visitors report regularly. Keep a look out for rising trends on the popular days and hours reports that do not correlate with sales. Check your suspect visitor sessions randomly throughout the month to make sure there are no unwanted visitors spamming your site. Carefully consider what size the images are that you upload to your store. They can have a large effect on your bandwidth. Block unwanted visitors as they come in. Do not wait for the end of the month, the visitor could return multiple times to drive up your bandwidth. There are no check boxes to the left of the Visitor Sessions report as shown in this post.